Medical devices made of metallic materials are often subjected to deburring to remove the slightest imperfection. 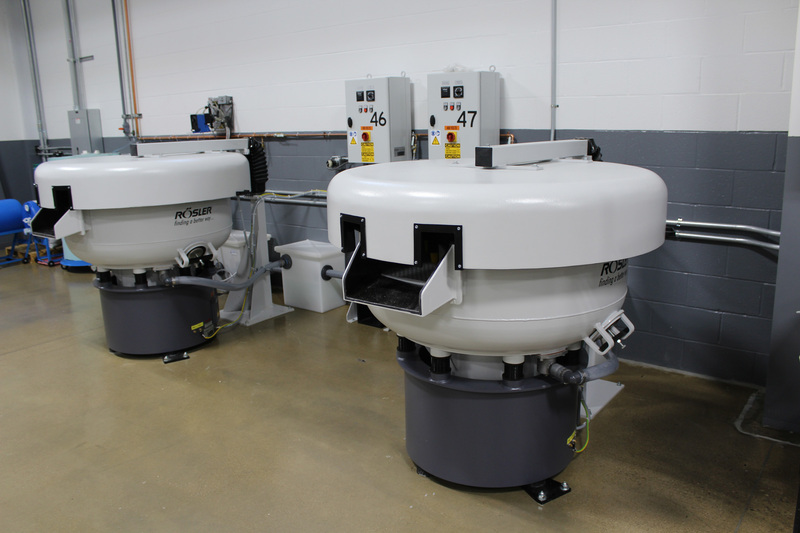 Norwood Medical employs both vibratory deburring and high-speed centrifugal deburring as finishing methods for our customers’ parts. With the ability to debur, clean and brighten the entire surface of a component, these manufacturing processes are ideal for finishing intricate medical devices. Vibratory deburring is a batch-type operation whereby specially shaped pellets of media and the components are placed into a vibratory tumbler. This process is designed to finish a large quantity of devices at the same time to provide a beautiful finish to the manufactured parts. Another process suited for finishing small parts and components is centrifugal deburring. In a centrifugal barrel machine, several cylindrical containers are mounted to a rotating base. The base rotates in one direction and the barrels rotate in the opposite direction, generating enough force to deburr parts quickly and gently enough for critical small medical components. Norwood Medical focuses exclusively on medical device manufacturing. We have over 40 years experience helping customers deliver innovative products to market with speed and lean manufacturing practices. In an industry that demands the highest precision to ensure the safety and wellness of medical patients, Norwood Medical understands and accepts its critical role in this supply chain.